NetAcquire Time Space Position Information (TSPI) hardware/software packages support data collection from a wide variety of sensors, including radar, telemetry, GPS, laser ranging, and video camera tracking systems. No matter where your data is coming from, NetAcquire TSPI products collect, organize and display it with reliability and ease. 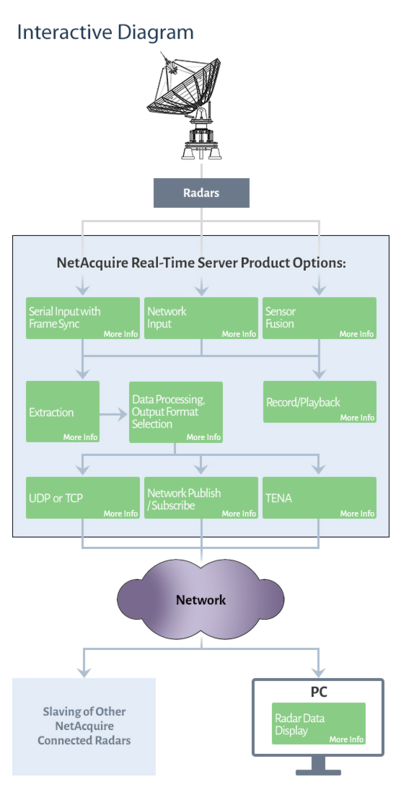 The flexible serial input/output of NetAcquire telemetry products also ingests specialized radar data formats and makes real-time data available over networks. Real-time data processing and data reformatting transmits TSPI data onto the network in your preferred format. To enhance performance and accuracy, applications may also utilize sensor slaving and sensor fusion capabilities that leverage data from multiple sensors arriving in separate real-time data streams.